Sunset’s old recipe for Chocolate Chip Cookies at their Best is one of my favorites, but I can’t say I had results the very first time I made them. Because the old recipe didn’t have gram measurements, I used too light a hand with the flour. In addition, I was out of brown sugar and blended molasses and granulated. The cookies were okay, but not really at their best. Now they are! Beat butter, shortening and both sugars with an electric mixer until very lightly and fluffy – Sunset recommends up to 5 minutes. Add eggs, one at a time, beating well after each addition. Beat in vanilla and lemon juice. Stir flour, baking soda, salt, cinnamon (if using), and oats together in a separate bowl. Stir flour mixture into sugar mixture. When well combined, stir in the chocolate chips and walnuts. Use a scant ¼ cup of dough for each cookie. Drop dough onto cookie sheets, spacing about 3 inches between each cookie, and bake at 350 degrees F. for 16-18 minutes OR, for softer cookies, bake at 325 degrees F. for 17 to 19 minutes. I always use the 350 degree temp. Hi Becky! Thanks for the comment. I haven’t made this recipe in a while, but now I definitely want to make it again and perhaps with the coconut oil. I recently purchased a carton of the butter flavored type and am looking for ways to use it. Also, I’m guessing when they developed the recipe they used a heavier 1 1/2 cups of flour. I typically use 4.5 oz per cup therefore my flour had a weight of 6.8 oz. I’ll bet Sunset used a 5 oz cup of flour and used 7 1/2 oz weight of flour and that’s why theirs were thicker and nicer looking. Will try with more flour. I found your cookie recipe on the web. WOW I have been making these cookies since it came out in Sunset Magazine in the ’70’s. The only thing I have changes in using chocolate chucks, instead of chips. Now I use coconut oil instead of shortening. NO ONE ever takes just one. I keep my recipe in a frame on the wall. Everyone should have this recipe. Thank you for the recipe. I received this cookbook from my college roommate as a wedding present 20 years. My 13 year old daughter lost that page a few weeks ago and I have been looking for this recipe ever since. I have made some adjustments to the recipe myself. I combine the the shortening and butter amounts. My cookbook amounts are doubled compared to this so it is 1 c butter + 1/2 c shortening = 1 1/2 c. I put in 3/4 c regular shortening and 3/4 c butter flavored shortening. Butter makes crisp cookies; shortening makes chewy cookies. I like them chewy. I also double the amount of oats, bake a batch and then if needed add a little flour. The oats help stiffen the dough without drying them out. I also have recently learned that adding a cup of vanilla pudding helps cookies stay moist. I haven’t tried it with the recipe yet but now that I have the recipe again, I will. 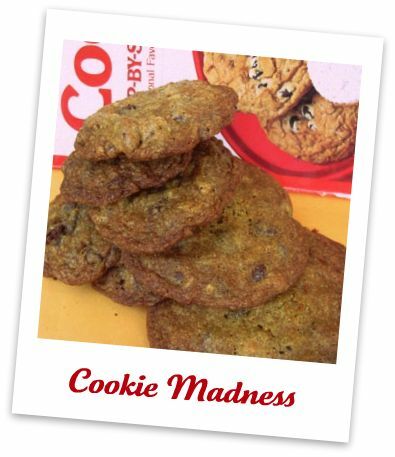 Make sure you use fresh baking soda and the cookies will turn out better. Also try the cinnamon. I promise they are good with the cinnamon. I made these cookies (from the Sunset cookbook) years ago and loved them. Then recently I tried them again and had the same problem (flat, weird cookies). I increased the flour, quite a bit, to almost 4 cups (yikes!) and also added about 1/3 ground oatmeal, and they turned out really well. My advice would be to try 2-3 cups flour and see what you think, then try adding more if necessary. Don’t fear! Those cookies look great. The Ivy Restaurant here in L.A .makes the best CC cookies around and they look like yours! This was my first ever cookbook! When I was little, my mom used to make me the black-and-white freezer cookies, and they were SO GOOD. Recently, I tried the peanut butter cookies (my favorite PB cookie recipe) and the English toffee bars, and both were excellent! Hi there! I wanted to add to your chocolate chip recipe collection. I hope you haven’t tried this one. http://magazines.ivillage.com/countryliving/recipefinder/recipe/0,,674530,00.html I baked it a few yeas ago. They are really crunchy. Those look alot like the cookies I grew up with. Who says ugly can’t be tasty? I just made a batch of One-Bowl Chocolate Chunk Pecan Cookies from Sticky, Chewy, Messy, Gooey…which may well become my go-to recipe. They are so easy and SO good! If you haven’t tried them, they’re definately worth it! 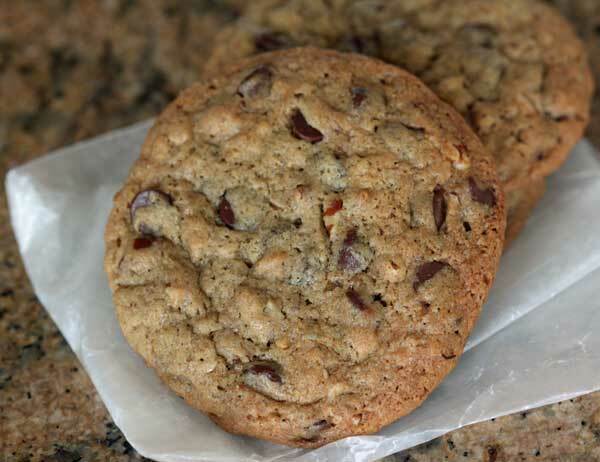 A chocolate chip cookie is almost welcome at my home, no matter how chipped and battered or sugared. Thanks, Anna-The second one sounds like exactly what I’m looking for. You’re a lifesaver! Here’s a really basic one that tastes very good. I got it from Cooking With Amy. It goes with the stout cake recipe and calls for two tablespoons of stout beer, but you could just use milk. Stir together softened butter, cocoa and 2 cups of the sugar. Add Guinness (or milk) salt and vanilla and stir again. Using high speed of electrix mixer (I use the whipping attachment on my stand mixer), beat icing for a minute. Add the rest of the sugar, adding just until you think it’s the right consistency. Beat for a good 3-5 minutes, scraping side of bowl often, until light and fluffy. Ice the cake. Another one I like is an old one from Good Housekeeping. It starts with a rather odd mixture of cooked sugar, flour, cocoa and milk. It’s easy, but you have to get an early start because the cooked mixture needs to cool completely. In a 2 quart saucepan, whisk together sugar, flour and cocoa until evenly combined. Add milk and whisk until smooth – don’t worry if there are a few lumps because they will smooth out as you cook. Turn heat to medium and cook, stirring constantly until mixture thickens and boils. Reduce heat to low, cook 2 minutes, stirring all the while. Remove saucepan from heat; cool completely. This should take 40 minutes to an hour. In a large mixing bowl, beat softened butter until creamy. Gradually beat in cooled milk mixture, vanilla and melted chocolate. Frost the cake. Hi–Not related to the cookies, but I’m hoping Anna will see this comment here. What do you recommend for a good chocolate frosting for a birthday cake–not too bitter and not too light–almost like the canned frosting in color and texture. It’s for a family party so it will need to appeal to kids and grownups. I figured you’d be the person to ask! This is what my cookies made with butter usually look like. They don’t look ugly, though! I used the same white sugar/molasses substitution the last time I made chocolate chip cookies (the alton brown chewy version) and had the same problem! They looked just like your cookies – but tasted fine. I like the name of that cookie and they don’t look ugly to me, in fact cookies never look ugly to me, lol! I also like that they have cinnamon! Oh my gosh, I have that book! I have not made those cc cookies…however, I did make the heart shaped linzer ones and they are the best. I’ll try your recipe for the cookies next week. I have a ton of cc’s to use. I am eating chocolate without a problem—Yeah! Thanks, Anna! Again because I love a crispy cookie these look great to me!! !